I’d been planning/hoping to visit for ages, but it seemed the home team was always too busy. Once an old contact from the days of Maison Nicolas Potel, Marco Caschera, took on a commercial role at the domaine, I pounced. I really enjoyed my visit, and the wines, but I had to ask about the rumours that the domaine was ‘for sale’ – ever loyal Marco wouldn’t be drawn, simply saying it was ‘business as usual’. A few weeks afterwards came the announcement (below). Afterwards I considered not publishing these notes, but then decidied ‘business as usual’! Véronique and Vincent Girardin have come to a decision regarding the takeover of the Vincent Girardin operation. Keen to ensure that this company with its world-renowned wines will continue to operate under optimum conditions, they have entrusted management of the company to Jean-Pierre Nié, a well-known professional in Burgundy who is also Chairman of Compagnie des Vins d’Autrefois in Beaune as well as being a commercial partner of Vincent Girardin for several years now. Eric Germain, Vincent Girardin’s right-hand man and house oenologist for around ten years, will be able to rely on Vincent Girardin’s astute advice in his task of perpetuating the high quality of the company’s wines. Marco Caschera, Sales Director, will continue is his role as Ambassador of Vincent Girardin in France and elsewhere in the world. Perhaps as many as eleven generations of Girardins have produced wine in the commune of Santenay. Vincent began his journey there in 1982 with just 2 hectares of vines – his father’s retirement delivered several more hectares and further ‘help’ came in the form of his wife, Véronique, in 1994. By the end of 2011 the domaine covered 20 hectares of vines, almost all in the Côte de Beaune, some worked on a fermage basis. But there was much more than the domaine; in 2010 they bought 20 hectares of vines in Beaujolais from the estate La Tour du Bief in Chénas and, of course, the engine of the domaine’s growth, the ‘Maison Vincent Girardin’, which as much as anything cemented Girardin’s position as a major supplier of drinkable wine, indeed he was reputed in one vintage to hold 150 barrels of Corton-Charlemagne. Maximising on potential sales, Girardin often used multiple labels in different countries, such as example of ‘Truffière‘. Today’s cuverie is set in the flat of the land to the east of Meursault, over the railway line in an ‘industrial estate’; plenty of well known names reside here though; Henri Boillot, Genot-Boulanger and also the barrel-maker Damy. And what a cuverie! 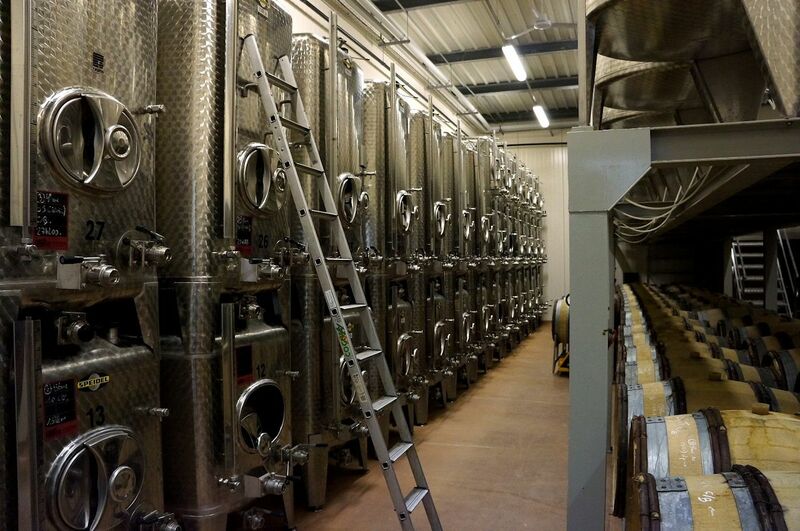 From 3 separate buildings in Santenay production moved to this modern cuverie – a single ‘mechanised whole’ with enough space to have a complete separation between the red and white cuvées. Production here is roughly 80% white wine, with approximately 300,000 bottles produced per year from the Côte d’Or. There are of-course another 200,000 bottles per year produced in their Beaujolais estate. In 1997 the domaine gave up using herbicides and pesticides and were certified as biodynamic in 2007, regularly ploughing the land. In 2010 they gave up their certification citing a need for more flexibility, for example the use of a systemic treatment if the need was really there. It seems to me that the domaine has given something back to the region too, if you see the way that they ‘re-mediate/restore’ some of the vineyards that they acquire – the perfect example is just on edge of the village of Chassagne-Montrachet – their ‘Clos du Cailleret’ with beautifully restored stonework walls. For the 2009 vintage, the team used for the first time their ‘Vistalys’ optical grape-sorting machine. Rather like Domaine Pousse d’Or who also started with this vintage – they were in some ways disappointed that they didn’t give it a more thorough work-out! There is ‘very little’ new oak used today – quite a change versus the 1990s – 80% of today’s barrels are sourced from François Frères; almost all the ‘smaller appellation’ whites are raised in the larger demi-muids normally seeing only a single racking before they are assembled in tank. Tasted in Meursault (sort of) January 17th 2012. Certainly a good set of wines here, let’s see how the situation unfolds in the coming months – certainly the team were in full flow only last month arranging tastings at the Grands Jours de Bourgogne. The only one of the 2010s in bottle. No pigeage only remontage. Dark colour. Powdery fruit (maybe a slightly dirty ‘clean glass’) Lovely crunchy fruit which is quite darkly shaded. South-facing vines – probably a good thing in this relatively cold area. Again a darker shade of fruit but the aromas are inviting. This is good volume to this wine, filling the mouth with a cushioned, sweet impression – again a crunchy quality to the fruit. A nice example. The grapes are sourced from the areas of Chassagne and Meursault but the ripe nose initially makes me think of Maçon. Full and sweet but with plenty of balancing acidity and good intensity in the finish too. Should be a good value wine I think. The 25 year-old vines here are essentially a continuation of Morgeots. The nose is deep, showing plenty of ripe fruit which actually does have a Chassagne character. There is a little spritz but it’s not needed as there is anyway sufficient character below – a nice agrumes flavour. Lovely. Most of the parcels that make up this wine are towards the border with Meursault. The nose is very 2010 with that clean soapy note. Again there’s a little residual CO2 the mid-palate flavours are of real Puligny. Very good acidity. The first parcel to be harvested outside of Santenay. From the ‘Desous’ section with a poor soil and lots of limestone. A high-toned and clean nose. In the mouth the flavours are reasonably wide but seem to lack a little focus, but the intensity in the mid-palate is certainly worth waiting for. It’s a good finish with a little salty lemon right on the end. A good wine. The aromas are fresh and clean but here have a little creamy undertow (25% new oak). Here is a lovely width and tension, the acidity and intensity grow together in the mid-palate. Lovely length too. Excellent Folatières. You can hardly miss the newly restored walls of this old Clos, this being the third vintage with ‘Clos’ on the label. The nose offers clean, high-toned aromas that offer a little herbs too. Mouth-fillingly full, a very fine mid-palate impression and super but rather linear flavours in the mid-palate into the finish. Very tasty! From the Aloxe side of the appellation. Hmm, this even smells like CC 😉 In the mouth there is an instant ‘hit’ of precision and clarity. Good intensity here and despite a finish of understatement this is very long. I would say this is a very classic CC; starting with a punch and slowly narrowing to a far-off singularity! The vines for this lie at the extremity of the vineyard only 10 metres from Pucelles. Here is a wine that doesn’t have the instant impact of the Corton-Charlemagne but is lithe and grows and grows in the mouth – becoming ever wider in aspect and certainly finishes wider and stronger if not longer than the CC. A completely different shape of wine. The nose is ripe at it’s core edged with some subtle creamy references – understated yet complex. The flavours start out even wider than those of the 2010 but continue to go forward at pace. Really complex and really fine – really!